Last month, Dan Jones set off to Outer Mongolia to tackle the Mongol 100 – believed to be one of the most extreme physical and mental challenges on earth. We were delighted to support Dan, primarily due to the great cause coupled with the colossal sporting challenge. Raising money for Children in Need, Dan had expected a serious examination, but he came up against even more than he had bargained for. We spoke to an exhausted but proud Dan to find out all about it. KUDOS: So, you did it. 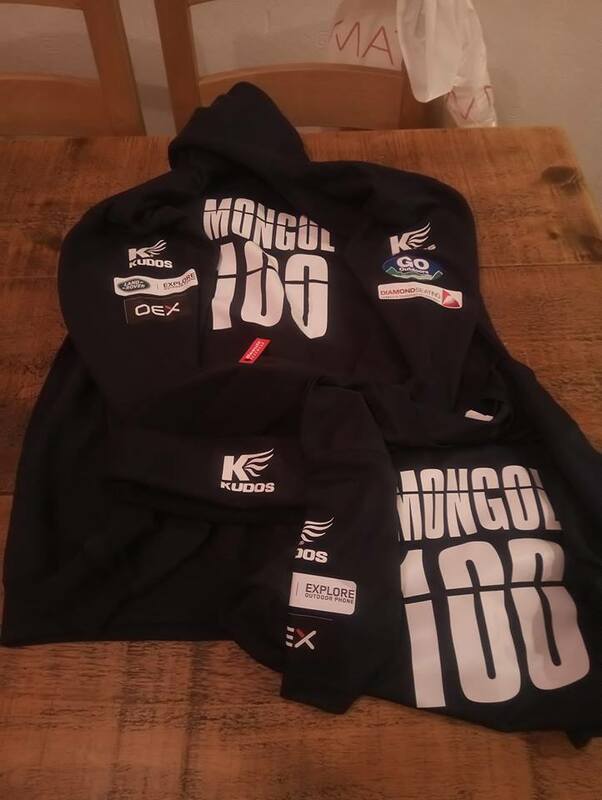 The Mongol 100 – completed. What was the feeling when you crossed the finishing line – was it elation, relief, a bit of both? Dan Jones: To be honest it was all those things and more. The buzz you get from doing an event like this is like no other. It was hard going and during some parts of the race I thought ‘why the hell am I doing this when I could be tucked up in a warm bed’ – but when you cross that finish line you get an overwhelming, euphoric feeling which makes all the pain worth it. Tell us about the race, and the unforeseen nightmare you encountered a few days in! It started pretty well? The race started off really well, I found myself in 2nd place pretty much the whole day. Around mile 20 I felt a slight strain in my left knee so decided to slow the pace down a little which resulted in me finishing the 1st day on the ice in 3rd place. The race went downhill from there really. My knee got progressively worse and after day 2 I knew the race was over for me. It was just a matter of trying to complete it now. On the last day around 90 miles into the race I dislocated my left knee. Worryingly for me this ended up being the coldest day, around -35 with windchill. After 20 minutes I plucked up the courage to lock my knee back into place. Last 10 miles was the most painful thing I’ve ever had to go through in my life. You received support and encouragement from the other runners, with people stopping to see if you were okay. Did you expect such camaraderie among the competitors? The camaraderie we all had was what made the trip so special. We all had our own battles on the ice. It was nice to share our war stories round the fire at our base camps on the shore of the lake after each day. We talked before you set off about the psychological demands – was it as tough, psychologically, as you’d expected, and how did you cope with it? There must have been some pretty low moments? I never expected the ice to be so demanding. It was the hardest surface I’ve ever run on. That was difficult. During the race we didn’t really have any focal points to aim for apart from the odd flag leading the way. It was just ice as far as the eye could see. That plays on the mind a lot, especially when I had to resort to moving slowly due to my injury. There is an island in the middle of the lake which marked the halfway point. It took us two days to get there from the start line but it was in plain sight the whole time. It never seemed to get any closer. For me that was pretty hard to deal with. You can’t train for stuff like that. Is it the sort of thing you’d do the once and tick off the list, or would you do it again and see if you can complete it without your kneecap taking a walk elsewhere? Ha! I’ve thought about that a lot. I feel very proud of myself and the other guys who completed it. I feel happy in myself to leave it at that and not to do it again. I have some other challenges planned in the near future which I would like to focus on. And the cold – can you describe what -30 feels like?! Very cold indeed. When the wind picked up on the lake you could feel your face burn, especially the cheeks and nose. Within a few minutes of starting each day I had ice building up in my beard from my breath instantly freezing. When the sun came out during the afternoon it became surprisingly warm. Even though it was averaging -20 during the afternoon the sunlight bouncing off the ice made it feel like you were running in a desert at some points but when the wind picked up or the sun went behind the clouds it was brutally cold. And finally, sum it up in one of these words – buzz, ordeal, experience, or a bit of all three? Definitely all three! It’s an experience that tested me to my core. I’ll never forget it. Thanks so much once again to Dan for taking the time to speak to us, and congratulations on a stunning achievement and raising so much money – £3575 and counting – for such a wonderful cause. You can still donate – simply visit the JustGiving page at: www.justgiving.com/fundraising/danieljonesmongol100. Previous ArticleNetball World Cup 2019 – what kind of legacy can it leave?